Are you one of 63,464 people aged 45 or over in Suffolk living with knee osteoarthritis? Or 37,883 people aged 45 or over with hip osteoarthritis? Our ESCAPE-Pain courses are here to help you manage your daily symptoms. ESCAPE-pain is a rehabilitation programme for people with chronic hip and knee joint pain. This offer is unique for Suffolk and is a well recognised national programme, run by highly professional ESCAPE-Pain trained instructors. "From attending the Escape pain sessions with Sue I have been able to stand up from a chair without holding on to the sides of the chair. Also it's helped talking to others about my condition." "I'm really glad I enrolled onto the hip pain course. 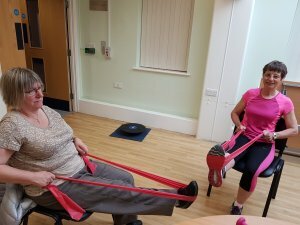 It has helped with my mobility and eased the pain." We are holding subsidised 6 week (12 session) group courses taking place twice a week in Beccles. To find the next group course in your area please call Active Suffolk on 01394 444605 during office hours for more information.